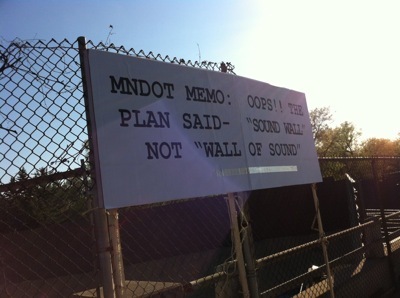 There is a lot of noise in my neighborhood about a new sound wall erected on I-94 by MnDOT. Some neighbors (on the north) are complaining they are getting more noise as a result of the wall (on the south side of the highway), as the noise bounces off that wall and up to their house, which is above the noise wall on their-own side of the freeway (and where the wall is punctured by Franklin Avenue). 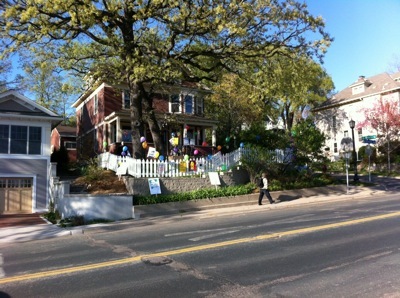 The house shown below has a party of signs and balloons with various anti-noise slogans. Noise is of course unwanted sound. Your music is my noise. It is a classic externality of transportation, and in fact one of the most costly (its economic value may exceed the cost of air pollution). 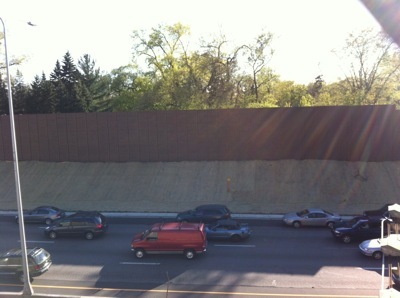 To reduce the amount of externality, transportation agencies erect noise walls, reducing the amount of noise on the other side of the wall (and thus diminishing the decrease in property value). But that noise doesn’t just disappear, it makes the road noisier, or it is claimed, in this case, the north side of the freeway. People can often adapt to a steady stream of white noise as on a crowded freeway, but it is the unusual noises (the one loud truck, the motorcycle, the airplane, the train) that are more disruptive and annoying. So who has rights here? If there is a homeowner, and someone moves in next door and makes a lot of noise, we often say the new neighbor is creating the noise externality. We often hear about the “Polluter Pays Principle”. But Coase (who is still alive at 101!) would say that but for the homeowner, there would not be an externality either. (If a truck roars in the forest and there is no-one there to hear, does it make a noise?) Either the homeowner should pay the neighbor to shut up, or the neighbor should pay the homeowner to get insulation and better windows, or the homeowner should accept the damages, or the neighbor should pay him for his damages, society is indifferent. What we need is a clear source of property rights. Clearly who wins and loses in these two circumstances does change with the allocation of those rights. Managing these externalities (so that we can avoid expensive “nuisance” lawsuits) is one of the important jobs of planning. Do I have a right to quiet, or do you have a right to make noise? Airports often face the question with their neighbors. Clearly airplanes create noise. Should the neighbors be compensated? Well, if the neighbors moved in after the airport already made a lot of noise, they paid less for their house (or pay a lower rent) already, why should they be compensated twice? If the airport is paying, then the airlines are paying, and if the airlines are paying, their customers are paying. But if the airport moves in after the neighbors had already built their houses (and to help tilt the playing field, the airport had been zoned as a park previously so there was no airport-anticipation), we feel it should compensate. In this case, maybe there is an inexpensive technical solution. Maybe there is an expensive technical solution. Maybe MnDOT should buy out Mr. or Ms. Unhappy-with-Noise and resell the house at a noise-affected discount with a noise-easement. Maybe Mr. or Ms. Unhappy-with-Noise will just have to live with a noisier world.